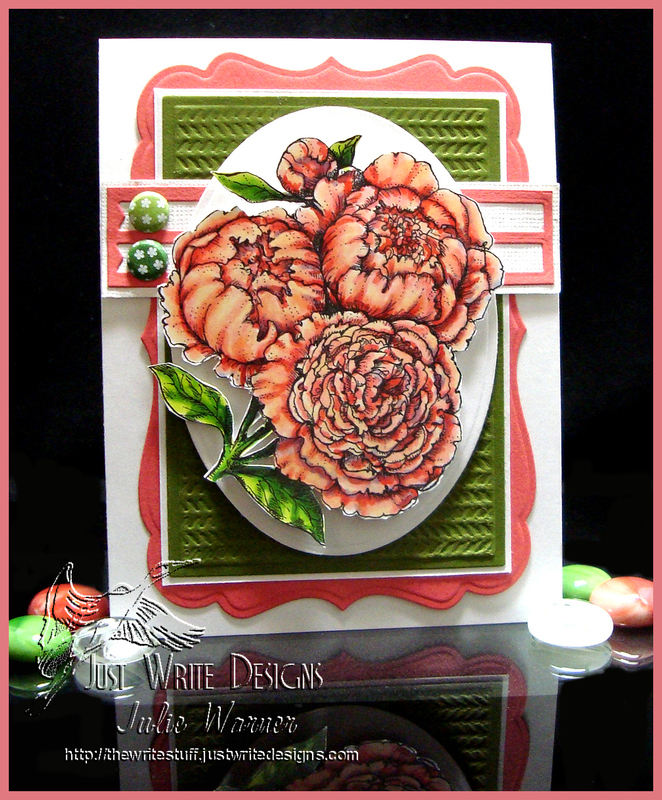 The theme for the Ways to Use It Challenge (WT531) is May Flowers. 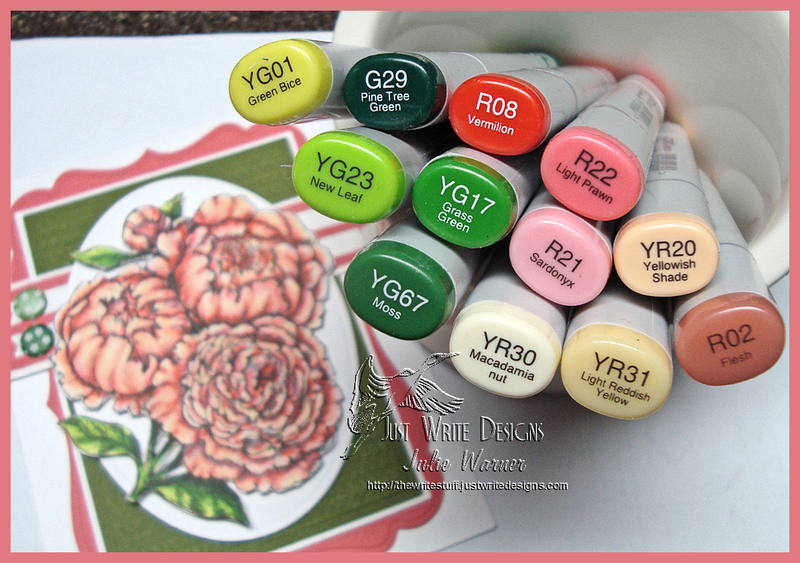 I recently finished this watercolor azalea card and it fits right in. Most of our azaleas in the yard have finished blooming but we have some satsuki azaleas in back that are just starting to bloom. I won this set from a challenge & I really wanted to use it for this card. 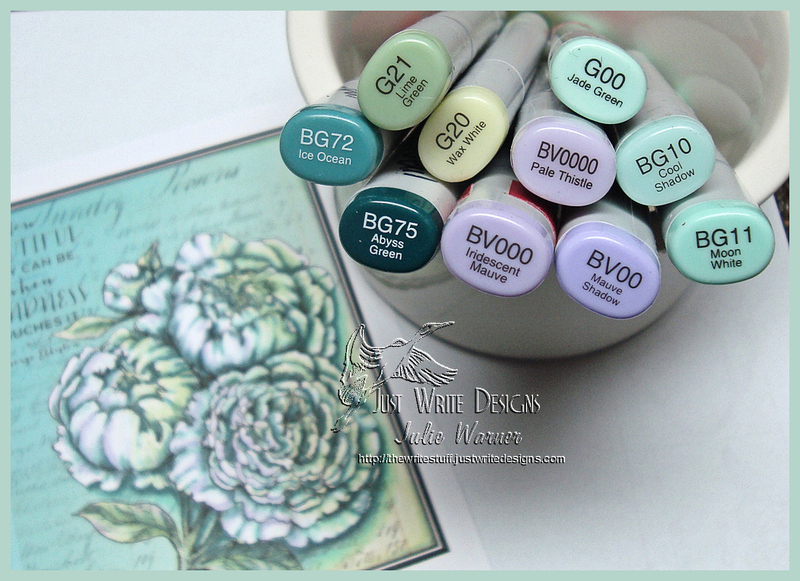 I was playing around with my recently arrived order of Brushos and for this background, I used them pretty much as you would normal watercolors. I wet the w/c paper, sprinkled on some pinks, reds, yellows & oranges then sort of blended out the heavy concentrations of color. After drying it with a heat gun, I stamped the azaleas w/ the Versafine then reverse painted them…meaning I used plain water, a paintbrush & a paper towel to lift some color from the flowers so they wouldn’t be as dark as the background. I also added some drops in the background using water. The oval was die cut out of the background, matted then replaced & the greeting stamped in the white space at the bottom. 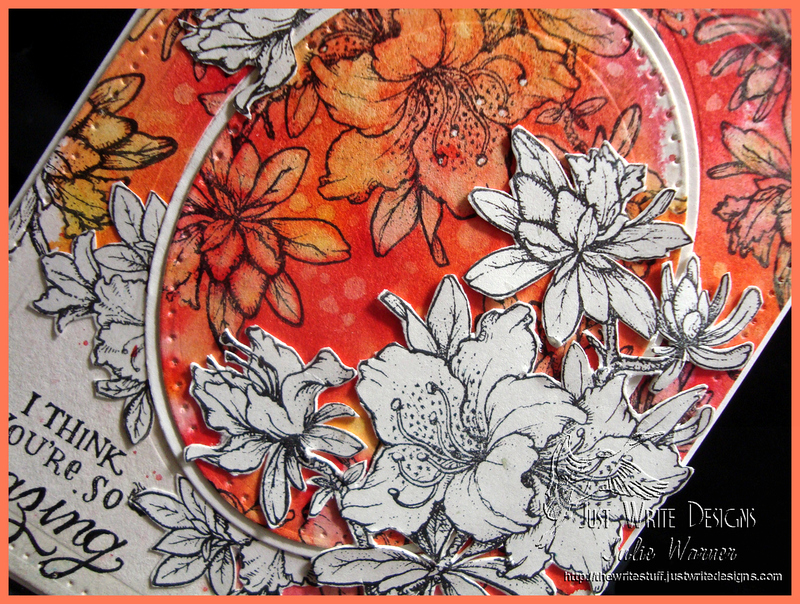 I saw that Power Poppy was having a May challenge to Cut It Out, so I stamped the azaleas again and cut them out. All of the white, non-colored azaleas were fussy cut. The finished card is 4.25 x 5.50 and here’s a look at the inside. I left it blank so I could decide later what greeting to use. And since I fussy cut those Azaleas, I’m entering this is Power Poppy’s May Cut It Out Challenge! Don’t you love these beautiful peony images? I think they are just gorgeous and I couldn’t wait to color them. 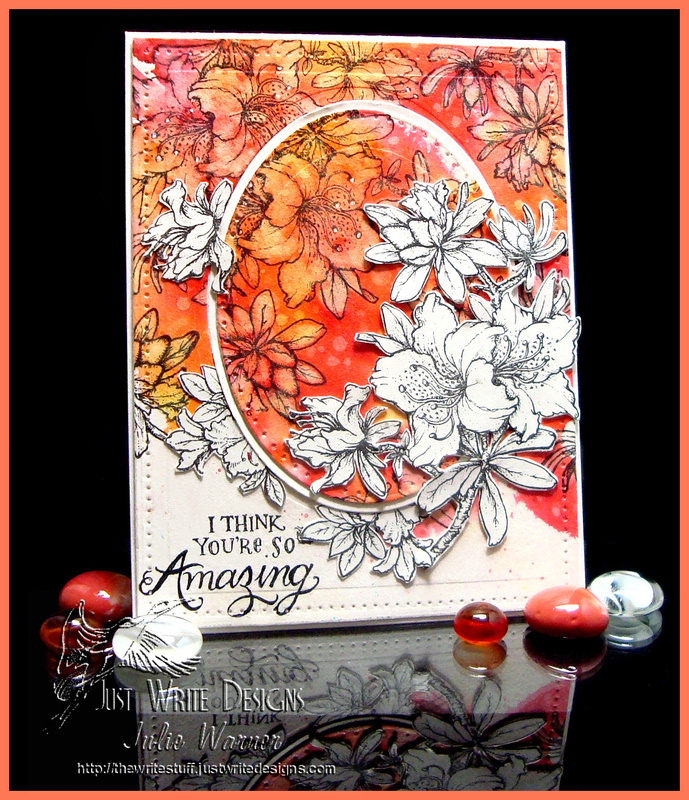 For my first card, I’m using the Unabashedly Upbeat Challenge (PPUPBEAT1) on the Power Poppy Blog. I thought it was an awesome album cover but for some reason I remembered it having some lime green, so I added it. Anyway, I like the lime green added to the mix and that’s my story and I’m sticking to it. I played around with the images for quite a while since my images are digital and I’m not really used to using digital on a regular basis. 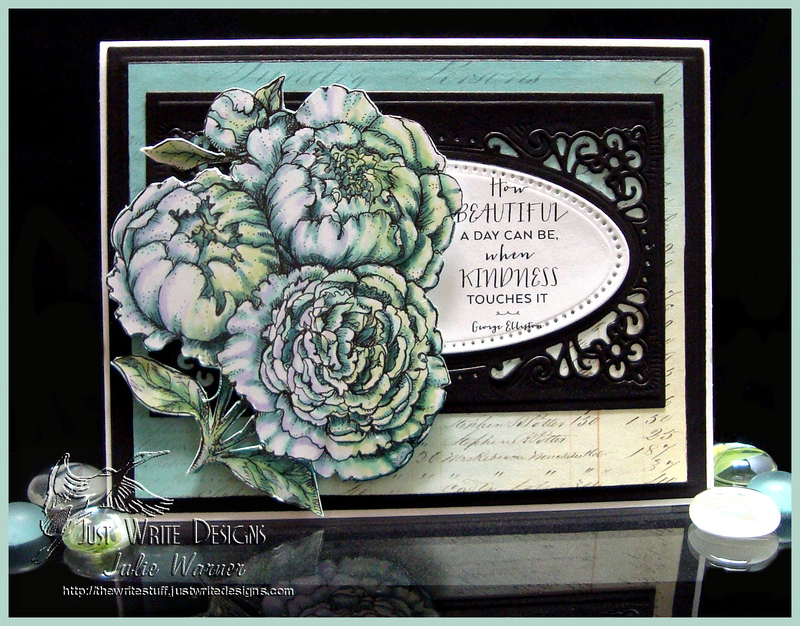 Originally, I had the peonies and the greeting all on one page, layered on a copyright free script ledger image and a gradient background I made. 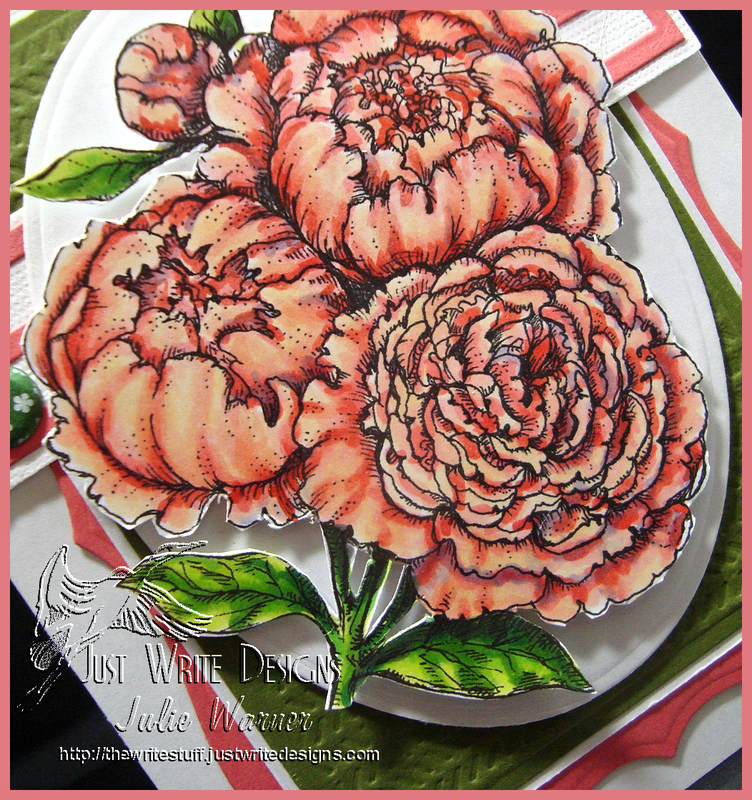 You can see how it originally looked after I colored in the peonies on the image below. It looked ok, but a tad flat for me, so I printed out another background w/ just the ledger and gradient bg, fussy cut the original Copic colored peonies and put them together like you see above. I added a die cut black frame and die cut the greeting then attached my peonies on top using some dimensional silicone. 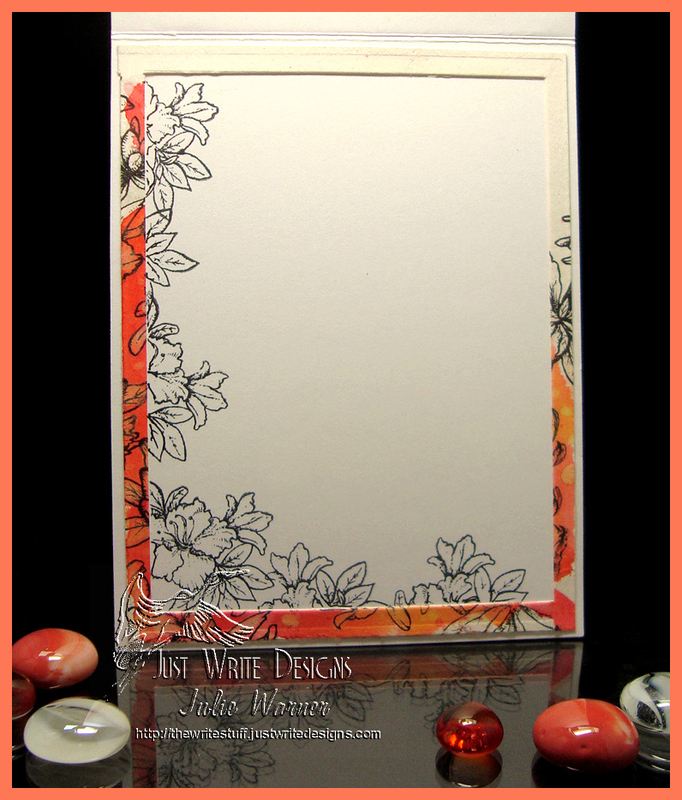 On my second card, I used the Sketch Challenge (PPSketch1) on Power Poppy blog. Again, since my images are digital, I printed out the peonies in a medium/large size and colored them with Copics. Usually I’ll just do an out of the box treatment on the image, but I wanted the peonies to be slightly elevated so I fussy cut them and attached them to a large white oval with foam tape. 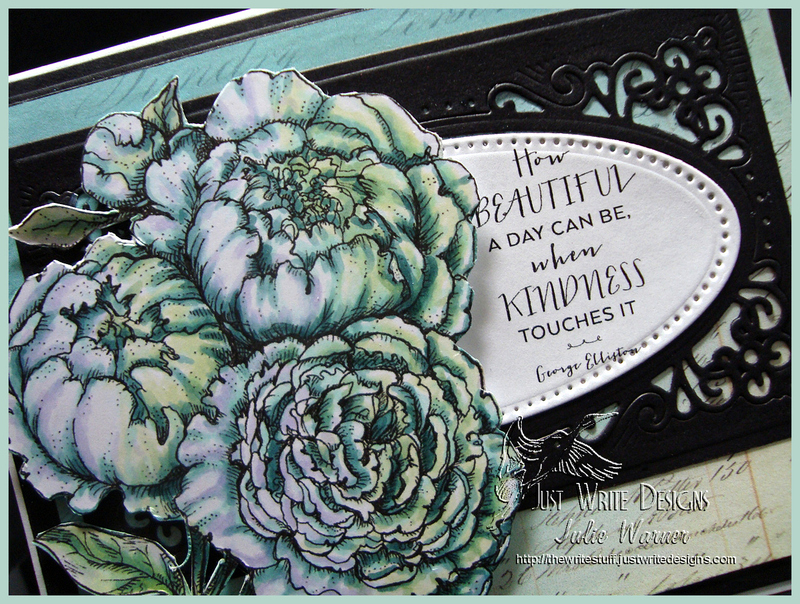 The green background was die cut w/ one of the matting basics dies then embossed for a little texture. I used the Perfect Paper Crafting mini rulers to cut the 1/16th white mat before adding it all to a die cut coral layer. I had a little trouble with the two horizontal bands, and I actually ended up using the negative from a die cut flag and backing it with a textured white strip. Two Candi dots in slightly different green shades were added as a finishing touch.